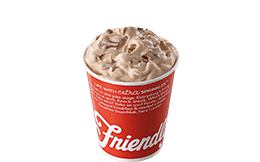 Everything you love about Reese's® peanut butter cups, whipped up into a Friend-z® with Friendly's premium ice cream. Everything you love about birthday cake, whipped up into a Friend-z® with Friendly's premium ice cream. 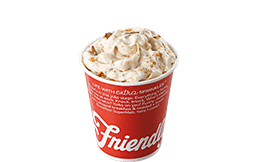 Everything you love about Butterfinger® candy bars, whipped up into a Friend-z® with Friendly's premium ice cream. Everything you love about Cookie Dough whipped up into a Friend-z® with Friendly's premium ice cream. Everything you love about Kit Kat® candy bars, whipped up into a Friend-z® with Friendly's premium ice cream. Everything you love about M&M's® whipped up into a Friend-z® with Friendly's premium ice cream. Everything you love about OREO® whipped up into a Friend-z® with Friendly's premium ice cream. 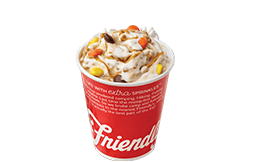 Everything you love about Reese's® Pieces Candy, whipped up into a Friend-z® with Friendly's premium ice cream. Everything you love about the combination of strawberry and bananas, whipped up into a Friend-z® with Friendly's premium ice cream. 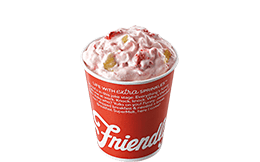 Everything you love about strawberry shortcake, whipped up into a Friend-z® with Friendly's premium ice cream.